I’ve been having difficulty getting this report off the ground. A Roland System-8 has been standing around here in my studio for months at less than arm’s length, intimidating me with its very presence. There was no way I was going to feel motivated to really and actually examine the thing. A couple of pics here, a couple of sound samples there. Then, dispair. Enough of those fleeting impressions, enough lighting orgies. What followed was the firm intention to just chuck it … not chuck it … chuck it … not chuck it. This went on for a long time. From today’s point of view, this is about more than just the System-8. The paralysis stems from deeper down. It has to do with the unequivocal turning point the Roland Company has taken. A turning point that the tried-and-true synthesizer enthusiast (and Roland fan of many years) has difficulty just coping with. But the world keeps turning, and so we accept things as they now are. Occasional Roland products have given cause for thoughtful frowns for some time now. And it is doubtful that company founder Ikutaro Kakehashi would have approved of present company philosophy. Overworked SH- and Jupiter-clones clothed in digitalia, bright TB-303 imitations, chic little plastic synths, lightweight turntables with a 909-logo. Where to put it all? In a professional studio? Part of the problem has nothing to do with Roland, of course, but with the heightened expectations of the users. For many musicians, Roland and musical life are two sides of the same self-minted coin — accountable for the characteristic sounds of whole bands and entire generations. Up to a few years ago, unique accoustical behaviour conveyed the (former) Roland rock-bottom concept of always giving the artist the very best. 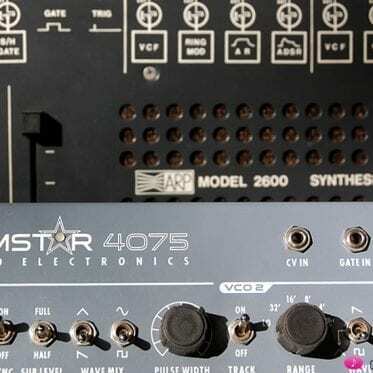 Juno-60, Jupiter-4, Jupiter-6, Jupiter-8 … SH-5, SH-7, VP-330 Vocoder and the great Modular-Synthesizer Systems 100, 100M und System 700: every one a posh instrument, every one Crème de la Crème. And even the small Roland analog aynths — as for instance the SH-2 and the cute SH-09 — are of exceptional musical and constructional quality (underlined by the fact that a lot of them are still doing good service today). 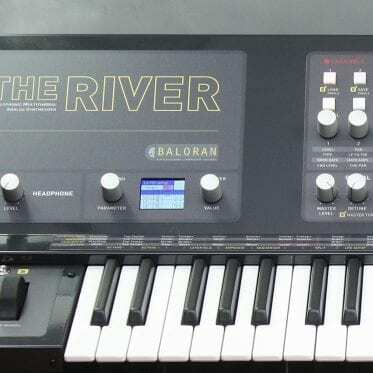 Later digital classics like the Roland D-50, D-70, JD-800, JP-8000 or V-Synth – all the way up to the Jupiter-80 – round off the generally positive picture of the noble synth smithy from Japan. So, in the face of such a glorious past, how are we now to cope with that new Roland generation of lightweight plastic instruments made in China? Inscrutable static coming out of nowhere, inexplainable chirps and clicks. By all due respect: The SOUND simply isn’t what it once was. It’s maybe OK, but it isn’t what the purist is looking for. And it isn’t what it was. Rather MID-Fi than HI-FI. And even when casting a mild eye at modern construction compromises (external power supply, plastic chassis, …), SOUND should not be compromised on. Now, casting woeful eyes back into the past and making comparisons with the present is one thing. Reclassifying mental priorities is another. 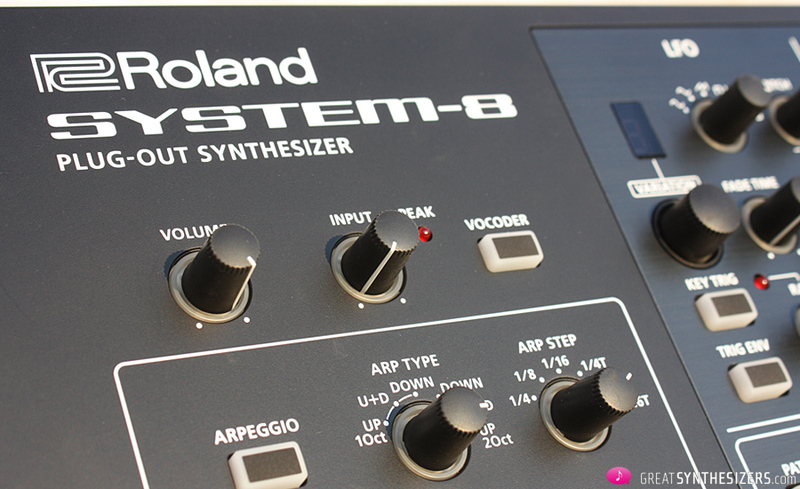 Then again, we have to be fair: The Roland System-8 is a relatively inexpensive Instrument, and it can do a lot. Which in these digital times is admittedly not the great challenge. 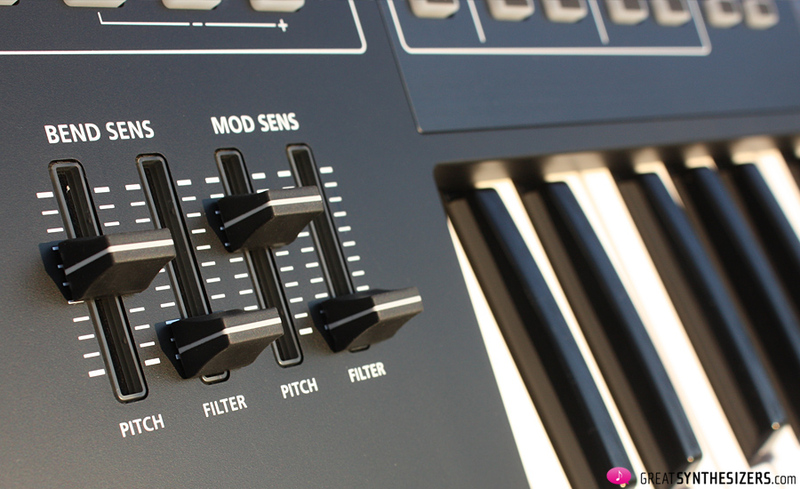 The System-8 is a well-rounded package deal: arpeggiator, sequencer, Plug-Outs for even more synth-sounds, a variety of details for sound designers, customer-friendly optics and robust control elements. Now, this is all very impressive. 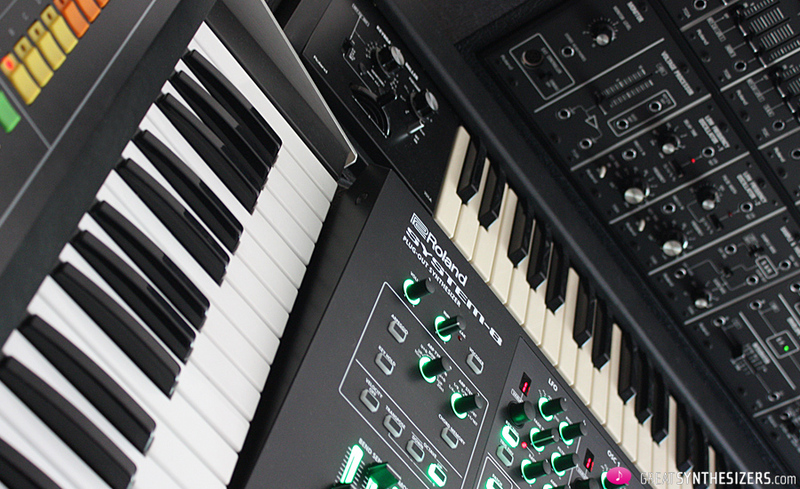 In addition, there are some little goodies to be found among the ports, especially for the analog-synth enthusiasts among you. An SD-card-slip enables the creation of simple back-ups. That is of course very practial and would seem to be a fast (and secure) solution for archiving data, seen in the light of the great sound diversity available on the System-8. Refined details of the sound architecture are what make the System-8 stand out. Filter resonance, for example, is rich in overtones — to a certain degree a real accomplishment for a device with analog character, even if it is just, in fact, the emulation of a voltage controlled filter. 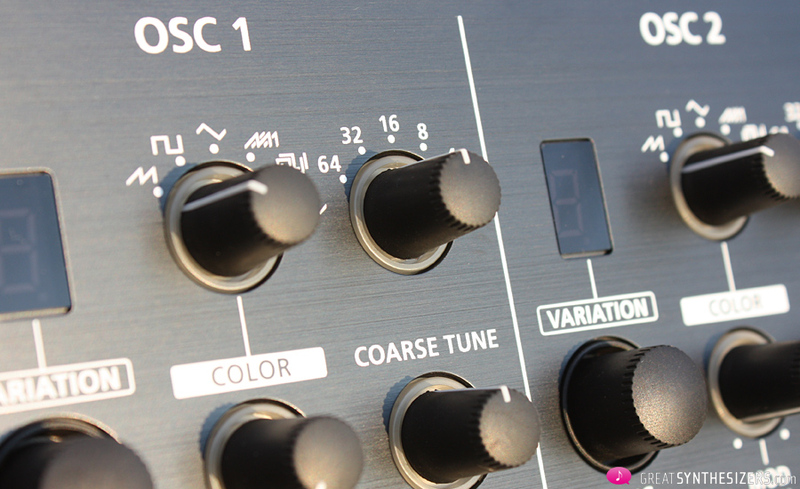 “Variations” give you just that, technically or sound-wise, in connection with oscillators, filters and the LFO. The bender section is astounding. The combined pitchbend-modulation lever is typical of Roland and nothing new, of course. Praise where praise is due: the bender is extremely stable and lies well in the hand. But it’s interesting: not all performance results are close to what you’d expect. To be specific: filter frequency bending is just too gentle, even at maximum settings (bender/FILTER slider all the way up – max. range of 255). 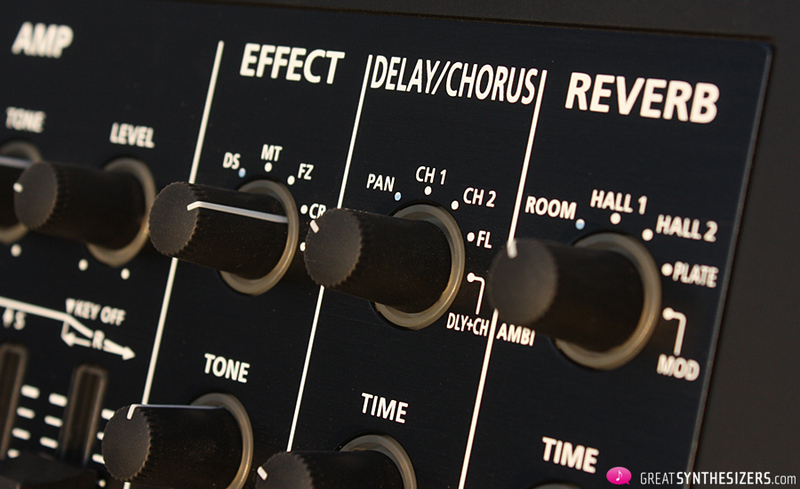 The desired “filter sweeps” are fairly tame, not even close to any sort of dramatic change in sound, whereas most users are looking for at least twice or three times that effect. Anyway, that’s what benders are designed to do: both subtle AND dramatic changes in sound. Along with all the surprises, something to get used to: by a change of sound, the settings in the bender section get “lost”. Which can be seen as an advantage or a disadvantage. 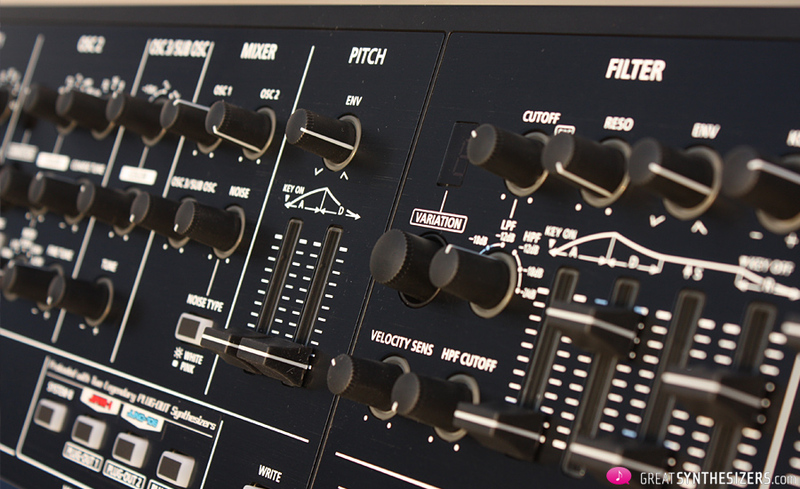 Let’s look back to the Jupiter-8. 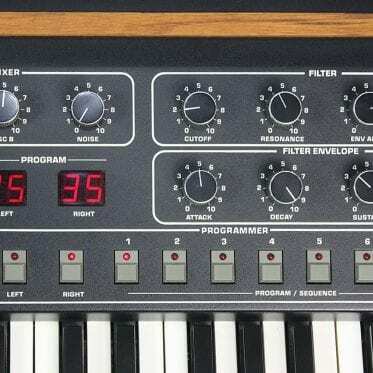 Its pre-set sliders and switches in the bender area (VCO at “exactly” one octave, VCF at maximum, or whatever) at the left side of the keyboard remain continuously available until changed by the user. Which has the advantage that (the pre-set) bender-performance remains available, regardless of what sound changes are made. Pre-set is pre-set, so to speak. The disadvantage: the settings for the said performance are permanent and therefore “not” a component of the archived sound (logically making an individual bender-performance per sound impossible). Now, with the System-8 it’s the exact opposite: the pre-set controls of the bender-area (which you’re LOOKING at, so to speak) reflect in no way the actual bender-performance which has been saved along with the sound. So our question: what’s to be preferred? A permanent pre-set (always available, but not savable) … or individual settings sound-per-sound (which may require constant correction of the faders, since their settings are not permanent)? So much for publicity. Whether that engine is now called an ACB or something else won’t really make a big impression on musicians, but the essence of what System-8 now stands for is visible here: a quailty emulation of analog sound synthesis. 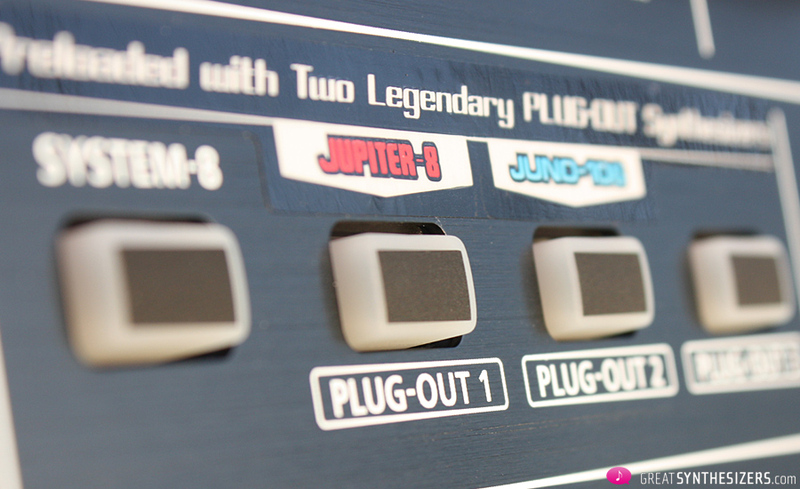 Nobody, but nobody believes that the System-8 is meant to replace the Jupiter-8. Or the Juno-106. It’s not as easy as all that. And be assured, some of those sounds (we can only make comparisons on the basis of our test candidate, the Jupiter-8 Plug-Out) were NEVER to be found on the original instrument. But then, that’s not the point: to be fair, many of the System-8 sounds appear to be really useful. They inspire the player, in their own way, to make music (creatively). Which is one very good argument in favor of a modern instrument. Anyway, audio purists might discover some noise in the System-8 signal path, along with some (inexplicable) “ticks” or drop-outs (listen to soundfile Electric Piano and you’ll know what we’re talkig about). 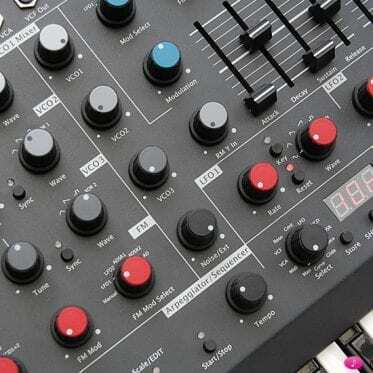 Now, stepping aside from all the sound details and conceptual extraordinaries, we reach the following fundamental insight: the System-8 helps keep the good tradition of analog synthesis (here: virtual analog) alive. The next generation of musicians has the enjoyment of twisting and adjusting on instruments that follow the classical, tried-and-true structure of OSC-MIXER-FILTER and AMP. Or of turning knobs, discovering the influence of a ring modulator on the interaction of the oscillators and exploring the effects of cross-modulation. That in itself is a very good thing. And should that nest-egg someday be big enough to fulfill the dream of a Jupiter-8, then the System-8 user will already be familiar with the Jupiter’s basic sound architecture. So far so very good. 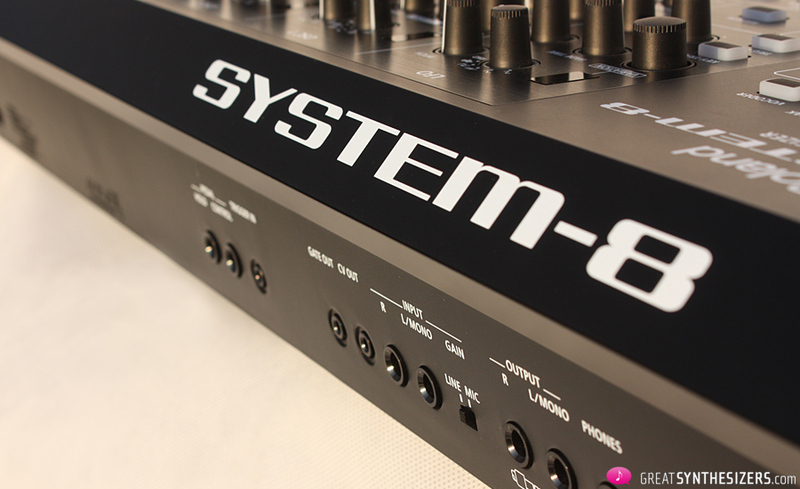 In addition, the System-8 has ist own very useful, musically effective basic sound. A battery of presets is at your fingertips and the Plug-Outs do their own stuff, of course, to widen your musical horizon. 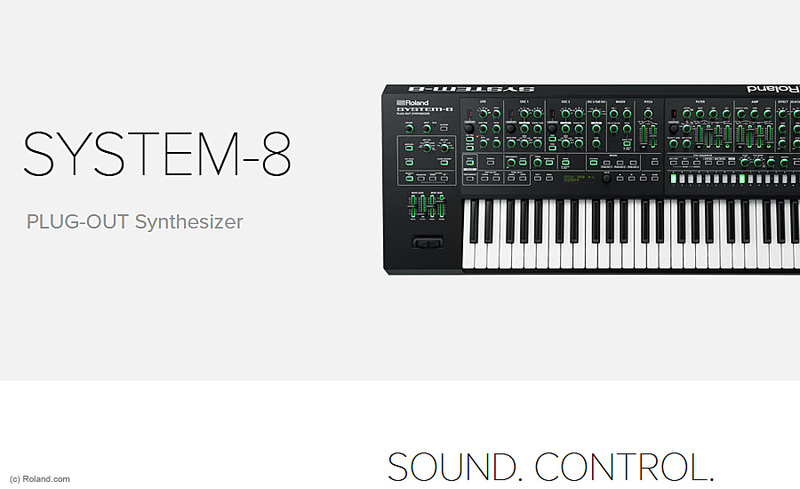 Which means the System-8 is a very useful and sensible choice as a sound-designer-synth. Its strengths lie — just one opinion among many, I know — in the experimental field and in the area of soundscapes and specially-colored solo sounds. And now a few questions. Why are Roland devices standardly equipped with that light-weight (plastic) hardware these days? 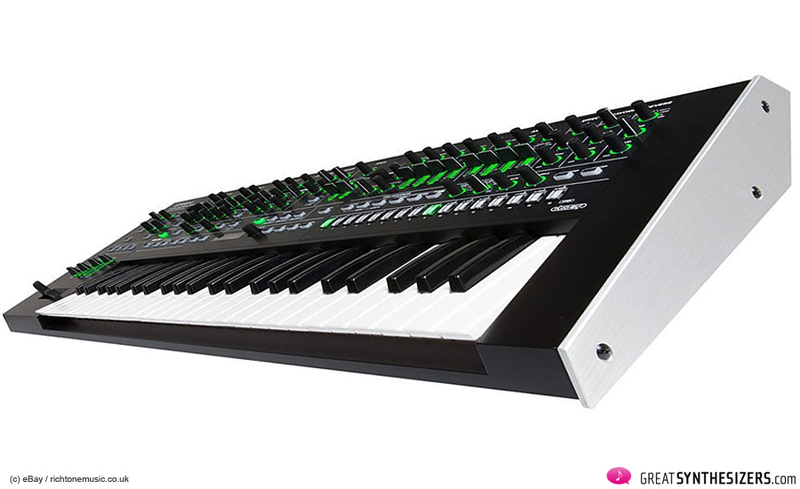 Then again, there’s that painfully short 4-octave keyboard, the shoddy external power supply (also to be found with the Roland JD-XA) and that penetrating green-lighting. You can’t even read the panel graphics if it’s really dark. (By the way – if you prefer a System-8 with the vintage look of a Jupiter, then try the metal wide panels of richTONE music … see eBay auction of richTONE music/UK). Other questions along the way: why does the oscillator COARSE TUNE range end at 11 (semi) tones? Sure, it IS possible to reach that last half tone by the FINE tune knob, but that means two work steps instead of one. Why not COARSE TUNE “12” from the very beginning? Which would also enable manual gliding from one octave to the next, a must-have in terms of sound-design. Our final question involves that ominous user’s manual. It should be called “The Pursuit Of Unhappiness” (with a bow to Paul Watzlawick’s famous book). Extra-thin paper, horrible black-and-white illustrations, endless lists and tables. Not a single friendly word in the direction of creative music making, and then – last but not least – that friendly green blinking all over the instrument. No in-depth information, unless you want to download a PDF they were kind enough to provide as an afterthought. But that’s how things are. 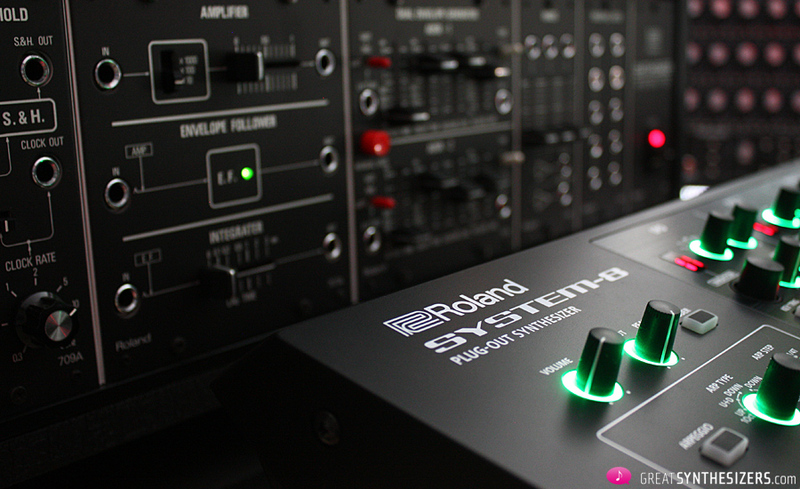 Roland veterans probably won’t break out in a dance of joy when they meet the Roland System-8. A true classic would have better hardware (heavy and stable chassis, internal power supply, 5- to 6-octave keyboard) and would put more polyphony at your fingertips (at least 16 voices should be possible in this digital age). 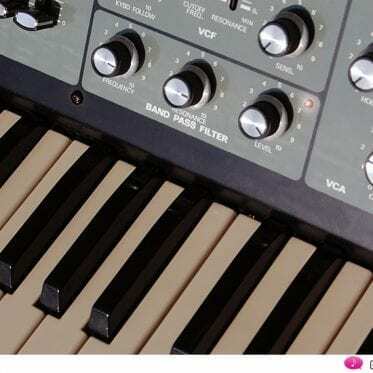 On the other hand, those same veterans already have a Juno-60, a Juno-106 or even a Jupiter-8, meaning they are in no way dependent on the System-8 for analog synth sounds in any way. Which brings us to the target group of today: the modern smartphone-generation, those guys with a limited budget and a weakness for blinking lights. 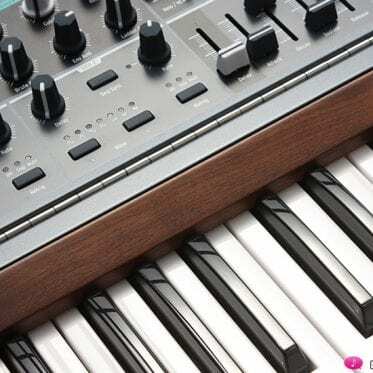 The System-8 will offer them proper sounds, some of which even have their own characteristics, pretty, green-light orgies and – a very fair price. 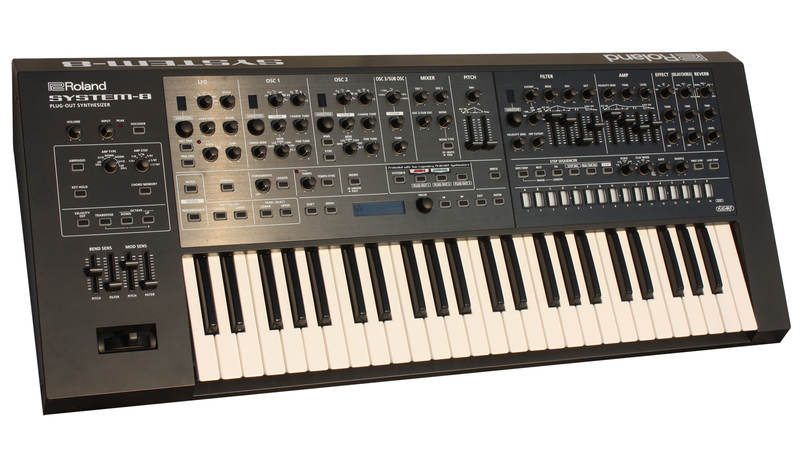 Its comprehensive performance department finally qualifies this instrument as an extremely useful VA-synthesizer, one that could have come from almost any producer, and which just happens to sport that glorious ROLAND logo. 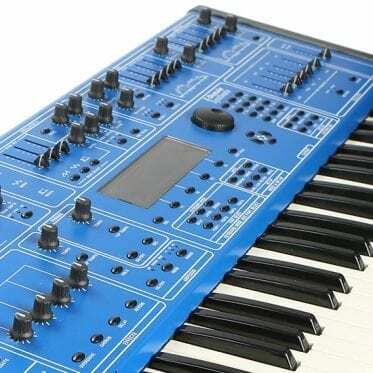 In the end, System-8 finds itself in the good tradition of analog signal paths and analog user surfaces. 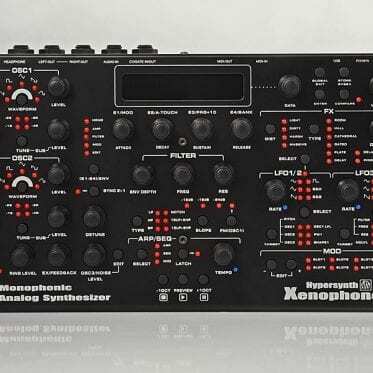 A real advantage, which raises hopes that Roland will one day produce a real new polyphonic analog synthesizer, based on its own classic, tried-and-true structure, a synth with all the excellence that goes into a true PRO instrument. 90% of the soundfiles were made exclusively with the System-8. The first example is very special, because it bridges 40 years of Roland history (feating System-700, Jupiter-8 and System-8). Many of the System-8 audiofiles demonstrate its impressive sound capital and its special sound character, especially in connection with those internal effects (delay, chorus, etc.). We have abstained from using MIDI and any external (computer) control. Hello! Thank you for the review..
Could I ask you about a minor detail?.. How the keybord feels? I wonder if the quality of keyboard action is acceptable or not. Is it a nice instrument to play? Hi Denis! The keyboard action is not bad – soft, smooth keys, acceptable so far. Nice to play (and to perform) thanks to the quality keys, knobs, sliders and switches. Nevertheless, I think it’s a pitty that there are cost saving details to be found “everywhere”. The keys are shortened (as we already noticed with the JD-XA), 1cm less in length. Some people don’t care, they don’t feel bothered at all. 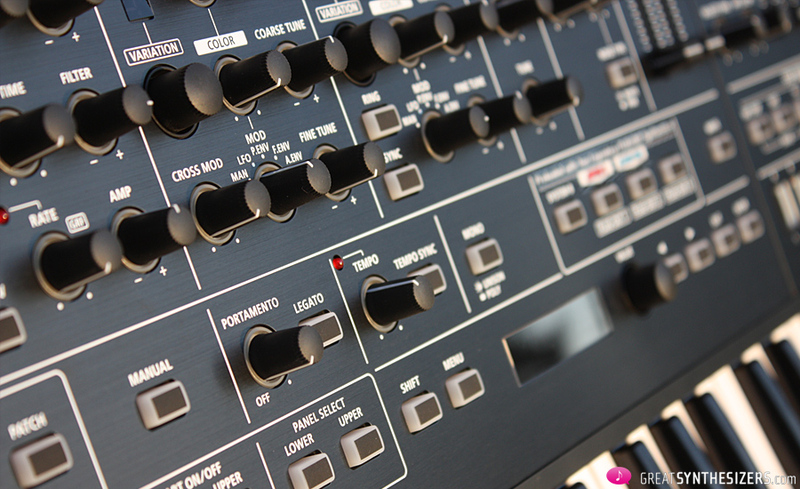 I always hit the panel when playing the System-8 (especially when playing the black keys). Shortened keys is another detail that “possibly” reduces the joy of playing the instrument. Overall sound is good, though. All in all, I’d say the price / performance ratio of the System-8 is quite fair. I am looking forward to buying it, but I can’t test it. Your comments are really helpfull! – Is that on-board sequencer capable of programming polyphonically (e.g. chords)? 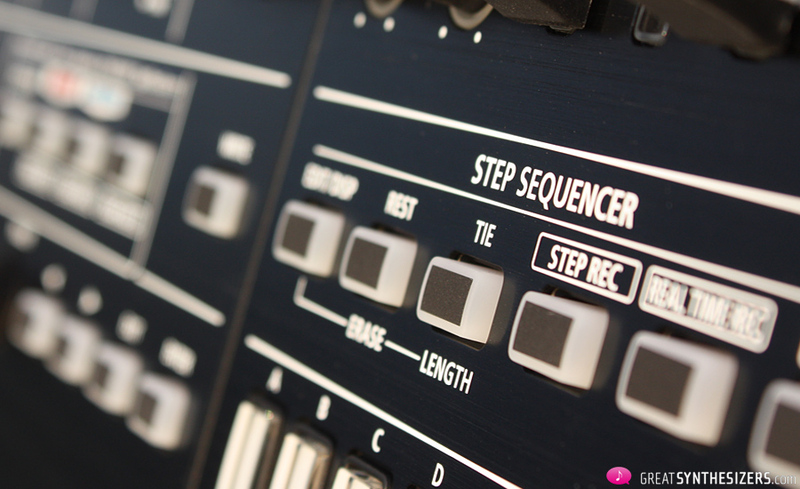 – Can the sequencer also send similar ‘poly’ messages to external devices via MIDI? Mostly curious is that sequencer can send POLY messages to external MIDI gear. Anyway, great, let me know! Thanks! 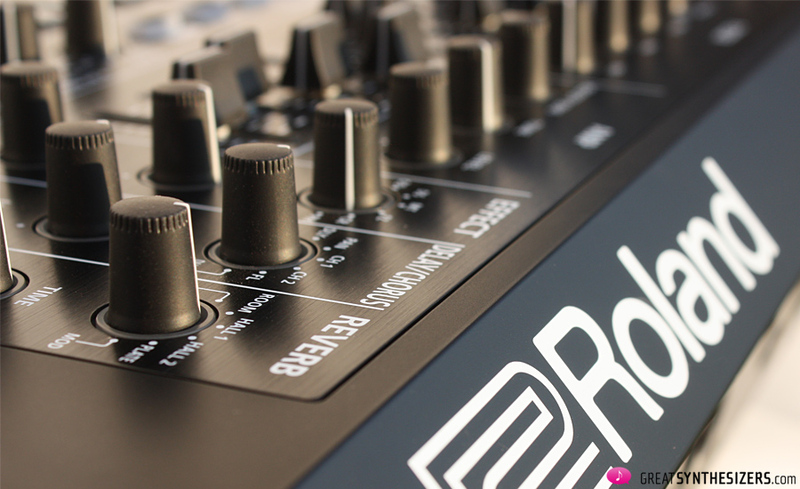 Previous PostSE-02 Boutique: Roland goes Studio Electronics! 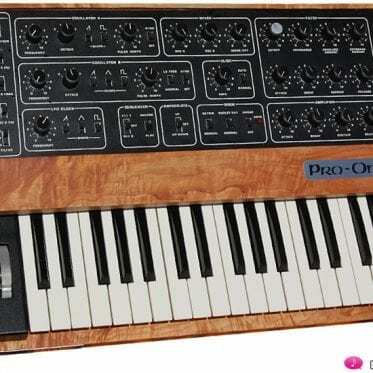 Sequential Pro-One – best vintage monophonic?